The icing on the cake for me is that when personalized medical care is mentioned in the document it refers not to ensuring that the patient gets that care that they want and that this care is consistent with their goals, but care that “employs genetic sequencing and other advanced techniques to customize medical care to the needs of the individual patient.” That's just dumb. If you want personalized medical care, start with the person and not a genetic test or some other "advanced technique" unless that technique is some type of communication skill used in a family meeting. I am impressed that you read the entire document but wholeheartely agree with your thoughts. It is disappointing that the IOM would issue this after their comprehesneive report last year about palliative care and dying in America. I wholeheartedly agree with your comments. I even considered writing a letter in response to the IOM publication. The "withdrawal of care" phrases jumped right of the page when I read it. I've been mentioning this idea of "appropriateness of CPR" for some time in my research group of mostly cardiologists. It goes back to the palliative care communication lesson around the world "AND" instead of "BUT." If we do the intervention of CPR, then we should do everything we can to optimize that intervention...AND...we should make sure we utilize that intervention among appropriate patients. This IOM statement reflects only the first half of that and in so doing, further perpetuates our incorrect cultural sickness that dying is somehow a failure. As as 23-year veteran in end-of-life decedent affairs, I am constantly amazed at the Obi-Wan-like waving of the hand by some clinicians ("these are not the droids you are looking for") who tell patients/families (who've chosen no CPR) "this is not the time for quitting, keep the CPR in place, he could be better by tomorrow...you don't need palliative care yet". For a 94-year old patient on their 5th admit in 4 months with ESRD, DM2, HTN, an ejection fraction of 20%, and septic with multiple bedsores? What does the MD's kind of "better" look like? We don't simply need more documentation of conversations, or even just advance directives and POLST forms. We need high quality nuanced conversations that address the complexities of likely risks and benefits, the spectrum of intensity of treatment, tradeoffs of quality and quantity of life, etc..
A hospitalist colleague I have been following for years as a inpatient palliative care consultant offers the "light switch" form of conversation: "If your heart stops, do you want us to restart it? Do you want to live?" If CMS provides incentives for completing a checklist, that's exactly what they will accomplish. The completing of a checklist, not the accompaniment of the most vulnerable among us. As geriatrics and palliative care physicians, we need to lead to ensure that the quality of these discussions is paramount and we should probably recognize that the real disruption for this terrible dilemma lies in the hand of people themselves to better understand the hazards of our transforming healthcare system. Thank you Eric for bringing this recent IOM report to our attention. It is disappointing that thought leaders in the cardiac arrest field have not connected the dots with palliative care. When the thought leaders don't get it, there's not much hope that the broader field will anytime soon. 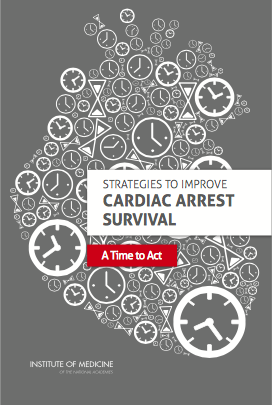 A couple of years ago, the Coalition for Compassionate Care developed a Decision Guide on CPR to help patients ... and healthcare providers ... better understand the medical intervention itself, as well as what the literature shows about its effectiveness. One of the lessons we learned is that "success rate" has a lot to do with the physical resiliency that the patient brings into the situation. So no recommendation should be made to a patient without taking that into consideration. In this day and age of increasing medically complexity among patients, we need to get better at understanding and seeing the situation from the patient's perspective (not just from the perspective of the particular body part or disease). At the same time, us folks in the palliative care field do ourselves a disservice by buying into the concept that some procedures are "life sustaining" and others are not. We know that feeding tubes in patients with advanced dementia, for example, don't increase length of life. And that palliative care can result in a longer life. Why is that? It's time for us to take a closer look at our assumptions about "life sustaining" treatment.